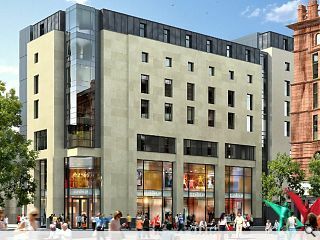 Farrell & Clark Architects are bringing forward plans to build a 209 bedroom Premier Inn hotel at St Enoch Square Glasgow with the re-submission of a demolition application and some minor design revisions to a previously approved 2008 proposal. Designed to enclose the south side of the mixed use scheme will include retail and commercial uses across ground and first floor levels together with a ‘robust base’ and ‘differentiation of storeys’ together with a modulated glazed corner intended to ‘make a proper connection’ to the square. In their design statement the architects said: “The hotel rooms being set back from each boundary sufficiently to allow the necessary fenestration to the bedrooms. 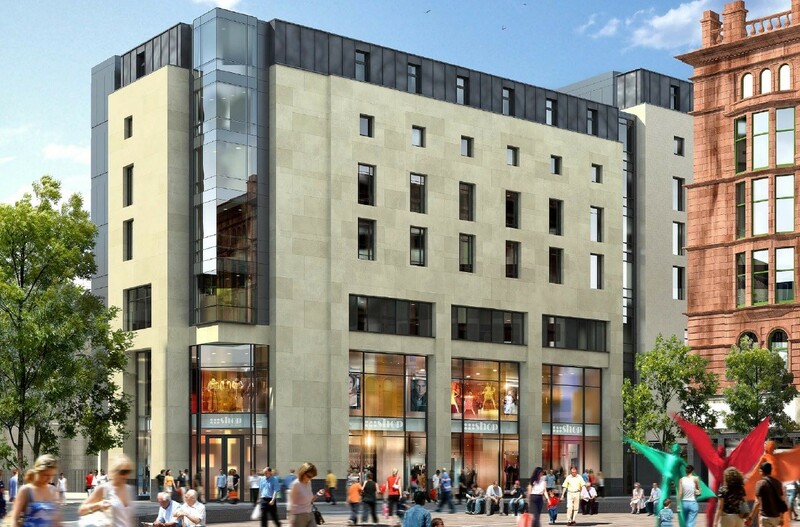 At the sixth floor level the external wall to the Howard Street frontage is setback approximately one metre to allow the proper relationship to the existing buildings in Howard Street as St Enoch Square is approached. Faced in limestone the L-shaped scheme will see bedroom windows set in deep reveals with a hotel atrium rising from second floor level through to the roof. Bland flat sandstone facades with a recessed lead or zinc roof level. These identikit designs are painfully common in Scottish city centres. Not every building has to be an architectural bobby dazzler, but surely we can do better than this. It would be better than what is there currently, but that does not excuse the faceless facade on the upper floors. It's always good to see and attempt at instigating ground activity. The problem I have with this is it is the same copy paste architecture repeated sober and over. Where is the personality? There is something more than a little awkward about the proportions of this one. It's very bulky, top heavy and as someone in this office noted "looks a little like a hunchback lifting their skirt". On the positive side it's high quality render of an ugly building. Once you see it you can't un-see it. Pretty 'meh' design- but in saying that it's about 1million times better than the shambles that is there at the moment. The location is one of the key connection to the river in the city centre, so it would be nice if they were able to make some gesture that celebrated that. Is it really better than what is there at the moment Gringo? Currently there is a low rise building to the south of a public square - to be replaced with this disproportioned beast of questionable proportions. If the best that can be said of it is that it 'is better than what's there at the moment' and that's the limit of aspiration then why not just build a blank wall because arguably that would be better too (what's there is obviously junk)... should we not be aiming higher? I would say it is an improvement by some stretch on what is there currently. Currently there is an eye sore of a building instating no form of street activity, and with very little significant presence in context to the area. At least this attempts it, but it is a little clunky, granted. For a Premier Inn it's probably not too bad, and at least the materials are of a higher quality than usual. What concerns me more is that to attract visitors to that end of St Enoch square they will need to sort out the situation with the current St Enoch homeless 'hotel' as I know of plenty of people who are put off going anywhere near that end of town due to some of the 'characters' that frequent that area. I like it. If we can't have the square as it was in its glory days then this is good . Glad to see the eyesore that is there being removed. I can't why the council should sanction the reduction of the top floor window sizes; tell them to build the original, approved version or bolt, please. I like that something is going to be done about that plot. What's there now is an eyesore. But they could be a bit more imaginative in their design to say the least. Again though, this is a huge improvement on the current state of that site. Delighted they are finally going to build here. I think this Hotel is greatly needed in St Enochs, I like the style of it!